“Even though small-island nation states generally are responsible for less than one percent of global greenhouse gas emissions, small islands are already expending scare resources on strategies to adapt to growing climate threats and to also repair themselves after they have hit,” says Maxine Burkett, associate professor of law at the University of Hawaii at Manoa, in this week’s podcast. The rise in climate-related disasters such as Cyclone Pam, which devastated the archipelago of Vanuatu in March, has elevated concern over the vulnerability of islands. “Island nations are seeing the development they’ve experienced in the last few years being wiped out in a day in some cases,” Burkett says. Sea-level rise is the obvious major threat. In Micronesia, more than half of communities surveyed for one study confirmed having adopted adaptation measures to prevent coastal erosion, but 92 percent reported having experienced continued adverse effects. The collapse of fisheries due to acidification is also a concern, as is “climate departure,” where the lowest average temperature becomes higher than the highest average temperature recorded during normal years. Tropical regions and islands are expected to experience this change first, perhaps as soon as mid-century, Burkett says. In Burkett’s home state of Hawaii, a recent heat wave caused classroom temperatures to peak at 101 degrees Fahrenheit. “I have two young children and I was sort of imagining what the lost opportunity is here when you have children that are attempting to learn under these circumstances,” she says. Shared concerns among small islands and low lying coastal countries have led a group to establish the Alliance of Small Island States. This organization represents 47 members and acts as a voting bloc within the United Nations, advocating for an effective loss and damages mechanism that would include disaster risk management, risk transfers through insurance, and compensation. The threat to small islands may be more visible today, but Burkett emphasizes that these proposals are not new. The Alliance of Small Island States has called for a loss and damages policy for nearly 25 years after Vanuatu introduced the concept in the early 1990s. Despite discussions at the Conferences of Parties throughout the years, the UN has failed to adopt such a policy given significant costs and the difficult political problem of claiming responsibility for climate-related damages. 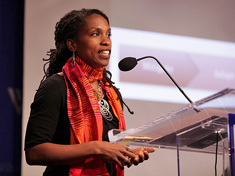 Maxine Burkett spoke at the Wilson Center on March 25.